Good Morning! Happy Monday! I had a fabulous weekend, it was very productive at the craft table. It was a pretty laid back weekend even thought it was busy. Saturday, we got the house cleaned and put up the tree. I got the entire week's worth of projects done and it was just a good weekend. I even enjoyed a glass of wine while having a phone conversation with my sister. So this week's challenge at Paper Pretties is up and we're playing with a color combo. Red, Green plus one other color. I pretty much stayed with red and green. 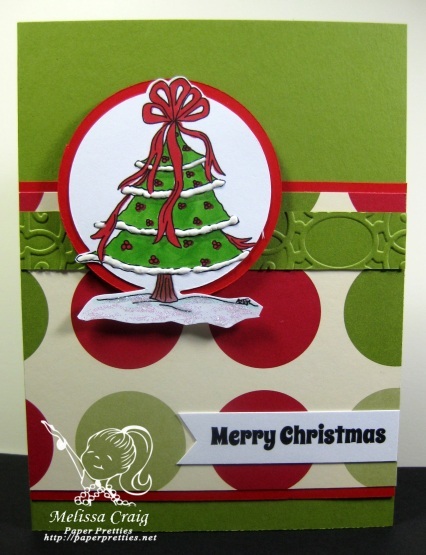 My card features a new image by ARTish, this one is called Berry Merry Christmas. I used the sketch from The Sweet Stop and it helped me create a fairly clean and simple card. It does have a bit of dimension, but not enough that it would require an extra 20 cents in postage. Hooray for less postage :) I'm about to make that large payment today. Yikes. Very pretty Melissa. Love the tree and the applique. The traditional colors look great. Thank you for playing along with us at The Sweet Stop this week. What a sweet card. Thanks for playing along at the Sweet Stop this week.